When remodeling your outdoor living space, it is just as important to bring the beautiful design elements that make a statement inside of your home to your yard. Putting a pergola in your outdoor living area is a perfect way to give your yard that extra charm that it might be missing. Using a pergola outdoors is a perfect way to define a space that you can kick back and relax in or an area to dine in. It will become the centerpiece of your outdoor living space. Gazebos or arbors are most often what people think of when they hear the term pergola. While all three of them share similarities, they are also much different in style, size, and functionality. A gazebo is usually round but can also be octagonal or hexagonal in shape. Gazebos have a solid, defined roof at the top of the structure and most gazebos are free standing and are open all the way around the structure. An arbor is much more like a pergola because of the fact that they both can provide shade and be used in walkways, but an arbor is more likely to have one or more sides closed off with open lattice siding. In the spring and summer months many people plant flowers and vines that will grow up the sides of their arbors and bloom. A pergola can be a free-standing outdoor structure, or you can have it attached to your house. 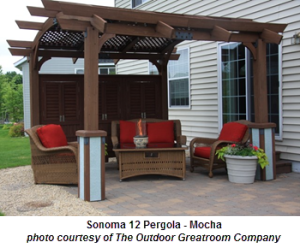 Pergolas can be built in both fiberglass or wood. They allow air to flow freely through the open sides and sun to enter through the semi-covered or shaded roof. In addition to having some seating and a table under your pergola, you can also add fire pits, grills, and other outdoor necessities to spice up the area and make it more comfortable. You can add features such as walls, lattice, a roof or fabric shade, lighting, and more. Pergolas also offer a little privacy in your yard when you need it. Designing an outdoor kitchen under your pergola is also a great way to add to the functionality of the design itself, and can be great to use in any season. Here at our Minneapolis landscape design and installation company we create beautiful outdoor spaces using elements like pergolas. Contact the professionals at Architectural Landscape Design to start putting together and building your dream outdoor living space today!